Summertime can be one of the best times of year—with family vacations, weekend barbeques, outdoor activities, and afternoon pool visits, it’s easy to see why it’s every child’s (and many adults’) favorite season. It can also, however, be one of the most dangerous times of year. From fireworks to pool parties to high temperatures, it’s more important than ever to be mindful, cautious, and attentive. While fireworks can be a fun way to celebrate the Fourth of July or the end of a baseball game, they can cause damage to both you and your property. The US Consumer Product Safety Commission estimated over 12,900 injuries and 8 deaths in 2017; The National Fire Protection Association estimates that fireworks start over 18,000 fires every year. The NFPA recommends leaving the fireworks to the professionals; In the Fort Wayne area, you can enjoy fireworks at a TinCaps game almost every weekend! As the temperatures begin to rise, the sweat begins to drip. With the highs up in the 80s and 90s, it is so important to hydrate and cool down. For children, who are constantly on the move in the summer months, taking a break to hydrate needs to be a priority. Dry, cracked lips, complaints of thirst, headaches, or slow, lethargic behavior are all signs of dehydration. If you have a child who doesn’t like to drink water, try adding lemon or lime slices for a fresh new flavor; also, encourage water-rich fruits and vegetables for a snack, like watermelon and cucumber. For pregnant women, it is especially important to stay hydrated. Water is a key ingredient in the placenta and the amniotic sac, playing an important role in the development of baby. Dehydration can lead to low amniotic fluid and low breast milk production. It can also induce preterm labor. 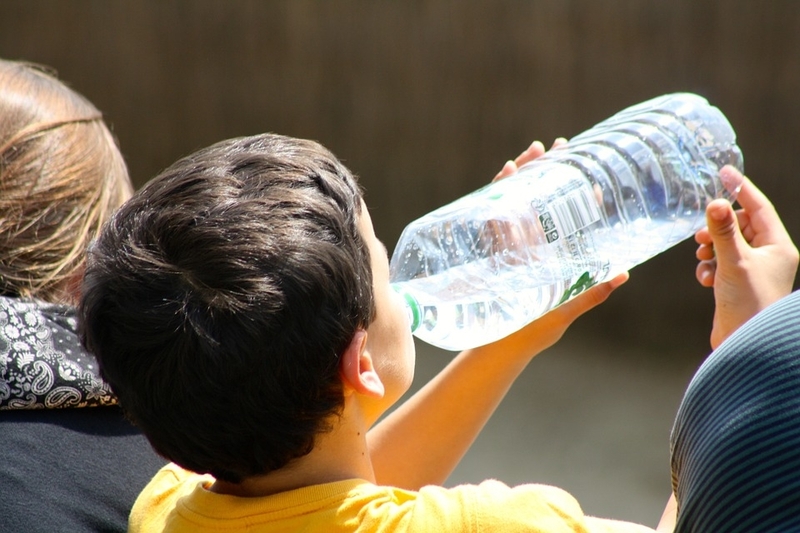 It is important to drink plenty of water and avoid activities that would cause overheating. Never, never, never leave your children or your pets in a hot car. Even leaving for a second can turn the car into a stifling, dangerous situation. If you don’t have air conditioning in your house, make use of box fans; plan your outings around the hottest times of the day, so that you can soak up the air conditioning of the grocery store or the mall instead of sweating it out inside. It is always important to be mindful of safe sleep, but, in the hot summer months that can be the cause for sweaty sleep, it is especially important. Overheating can increase the chances for Sudden Infant Death Syndrome (or SIDS). Denis Leduc encourages keeping the temperatures around 68 degrees and using a light sleep sack. He adds that fans are a great way to cool down a room, but don’t have it pointed directly at baby. 1. Alone – Baby should be alone in bed, not sharing a bed with a parent, sibling, or another caregiver. There should be no pillows, bumpers, stuffed toys, or blankets in bed with baby. 2. Back – Baby should be placed on its back to sleep, never on its stomach or side. 3. Crib – Baby should sleep in a safety-approved crib, bassinet, or pack-n-play; the mattress or mat should be firm with only a tight-fitted sheet. Whether at the community pool and the lake or in your own backyard, it is important to be attentive and alert when your child is around water. 4. On a boat or engaging in water sports, always wear a life jacket! With children, it’s important to establish consistent rules. From public pools to water gun fights to lazy days by the lake, water can be a fun ingredient to any summer day. Just be sure to stay safe! With all the parks and trails that Fort Wayne has to offer, there are many great ways to stay active in the summertime. Biking, rollerblading, roller-skating, skateboarding, and scootering are among the most popular outdoor sports. They, like any other summer activity, can come with risks. Reduce your risk of long-term injury by wearing your helmet. If you’re going to be riding more dangerously, add some elbow pads and knee pads.